Vintage Diary with scrapbooking style. Upload your own logo as header logo for best appearance. hi, i can't seem to apply it in my blog. :( can you help give me tutorial please. Hello I like this template for my blog but there is a problem, it has not "comments", can you help me please?. Sorry for my english. Thanks you. just downloaded it... thanks! it's great! I took this Beautiful Template for my blog..tq..
thankyou for the template :) i want to use this , mind to blogwalking to my site ? Well, I'm using this template. Thank you for made it looks like me. Saya pakai template ini, dan blog saya jadi cantik deh. Terima kasih! 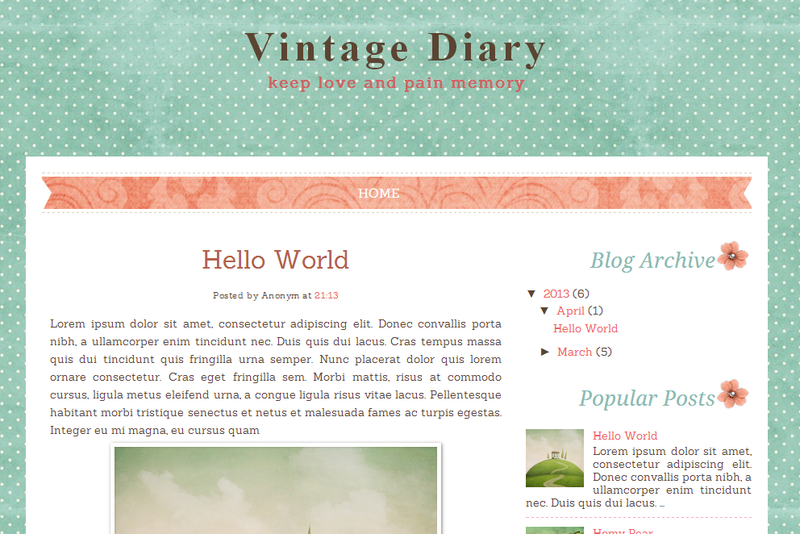 I really dont understand how to apply this theme to my blog, im new to this stuff..
Hi! I love this template <3 I wanna thank you for it and with this occasion I wanted to tell you that the template doesn't show the share buttons at the end of the posts anymore. I used a different widged from the internet but the original ones were much more accesible. trus kalo caranya memunculkan share buttons nya gimana ya?